Carrie Lanceley was an Australian soprano, from Willoughby, a northern suburb of Sydney Australia. I’ve located the following references to her. Willoughby’s First Fifty Years: A Retrospect of the Jubilee Period of the Council of the Municipality of Willoughby for the years 1865 to 1915. Later on (in December, 1903) the Council’s patronage was granted to Miss Carrie Lanceley’s concert, also given on the occasion of her leaving for London. BREEZY BITS FROM SYDNEY CITY. Soprano Carrie Lanceley, whose high “C” astonished the Bananalanders at a recent Liedertafel concert, is leaving the land of the golden fleece for gay Paris. The song-bird goes to study and woo fame. Her admiring compatriots will benefit her on March 23. Miss Carrie Lanceley leaves for Paris early this month. During March she sang at two large concerts and at several smaller functions. Her fresh, bright voice and winning manner will be much missed at Sydney’s concerts. Miss Lanceley’s first public appearance in Sydney was as Senta in an amateur performance of Wagner’s “Flying Dutchman,” given in the Theatre Royal. She made an instantaneous impression in the spinning chorus scene. At her farewell Sydney concert, Miss Lanceley was associated with many of the same singers. The most enjoyed number of the programme was “Oh, for the Wings of a Dove” (Mendelssohn). The young soprano sang the solo, supported by a chorus. Several Australasian singers appeared at the National Sunday League concert at the Camberwell Palace on Sunday evening. They included Miss Carrie Lanceley, Miss Alice Hollander, and the Misses Aileen and Doris Woods, the New Zealand twins. Miss Carrie Lanceley and her melody maids appeared again last evening at the Opera House in conjunction with Pollard’s Pictures. A full house greeted the talented party and throughout the concert the audience was unstinted in its appreciation of the various items rendered. Mr Pollard has been able to arrange with Miss Lanceley for she and her party to make a farewell appearance next Wednesday when she has kindly consented to give “request” items, as already a number of request she has received could not be acceded to in one short programme. She will also render a programme of English, Irish, and Scotch music. We predict a bumper house. The well-known Sydney soprano, who will shortly leave for America and Europe, Her farewell concert is to be in aid of the North Shore Hospital. 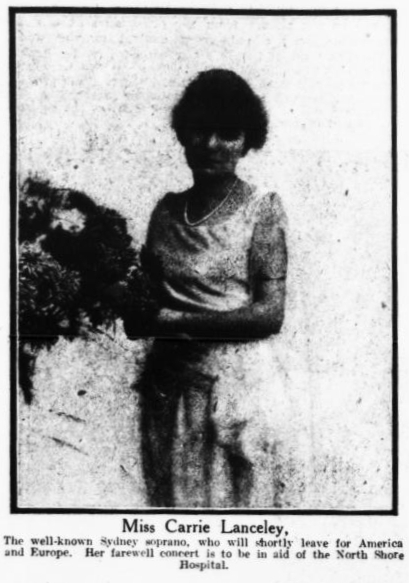 In 1922 she was touring the Tivoli theatres of Australia. A very traditional coupling on record of Ai nostri monti and the Miserere from Il Trovatore. This is a record on the short lived Pioneer label, which came into being in 1914, and lasted only until 1915. It’s on an earlier black label pressing, making 1914 the likely date. The two soloists are Carrie Lanceley and Gwilym Richards.